We have plans to retire someday somewhere warm and with plenty of sand. And we could definitely see that happening in this new double wide mobile home design we found online. 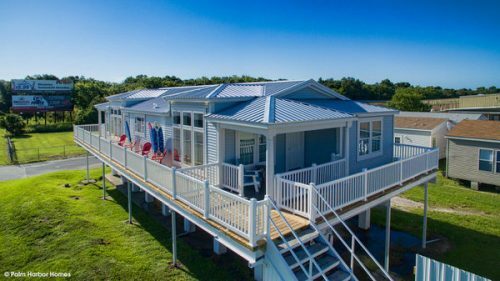 The Riviera II by Palm Harbor is only available in a few select Southern states, but it even sits on the lot on stilts! Perfect for coastal living and those hide tides. 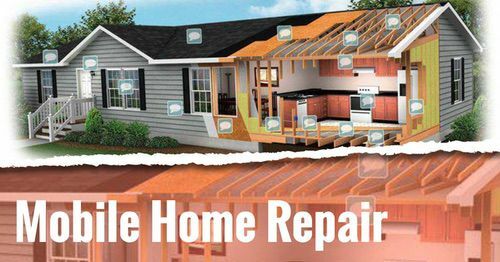 Please remember, we are not affiliated with any dealers or builders. 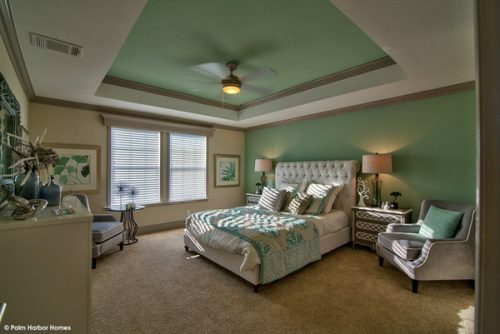 These are just our thoughts and opinions about the homes based on the images. 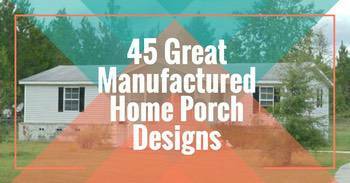 We just like to look at beautiful manufactured homes and talk about them. 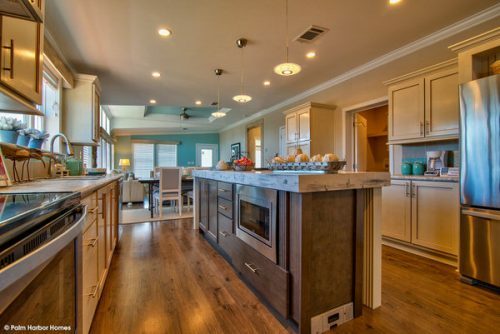 The first thing we always like to look at when we are looking at mobile homes is the kitchen. And this double wide mobile home design has everything a kitchen should have. 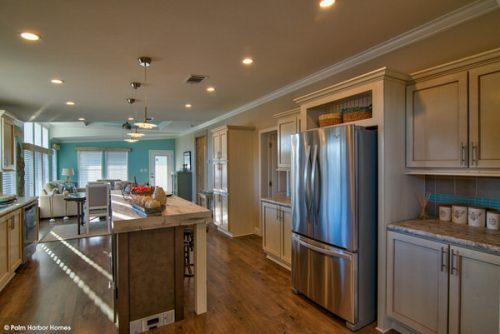 It features an abundance of counter and cabinet space, along with a huge center island that provides a place for a quick breakfast as well as a spot for the microwave oven. 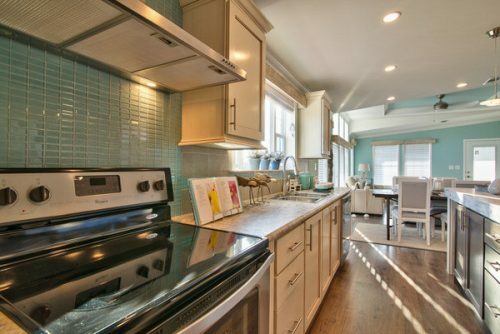 We especially love the glass tile they used as the backsplash. It is a perfect compliment to the light colored cabinets and wood look countertops. Glass tile makes for a gorgeous backsplash. A multi-purpose center island is perfect. There is no shortage of storage space in this kitchen. 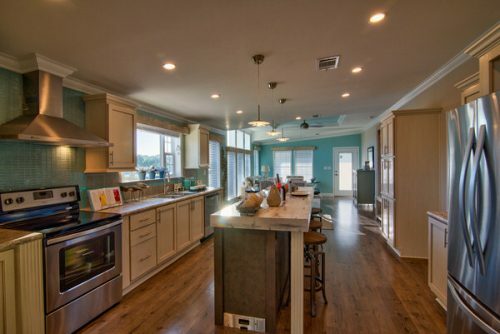 A beautiful example of an open floor plan. 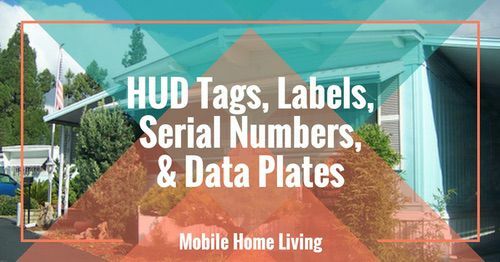 This mobile home has many things going on at once, and still, they have been able to pull it together to create an amazing design. Seems like they may have been trying to combine a coastal feel along with a rustic farmhouse look. For example, the barn doors and rustic flooring and trim are all trademark rustic farmhouse. However, the colors throughout lean more towards the coastal beach feel. Whatever look they were going for, we love it! Related: Beach cottage decor ideas for your own mobile home. 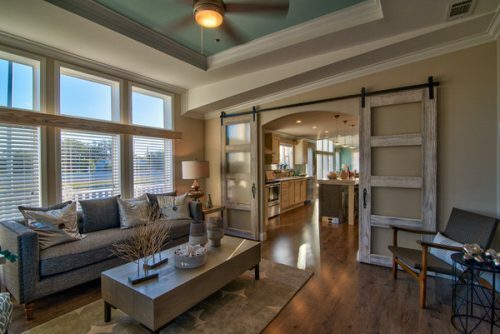 The barn doors are a nice compliment to the already gorgeous room. The dining room/parlor area features tons of natural light. One thing we noticed was the ceilings in the mobile home. 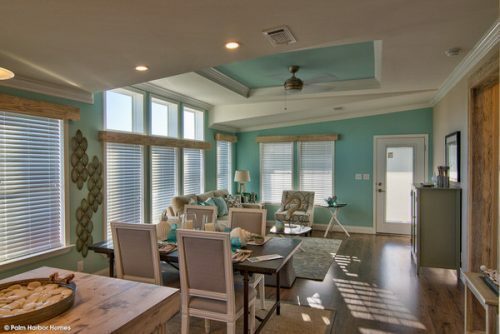 The contrast color of the aqua green in the recessed areas of the ceiling work well to tie the entire home together. And as we talked about a couple of weeks ago, pastel paint colors are trendy for 2018. We also love that the attention to detail that went into the kitchen backsplash carried over into the tile work in both the master bath and the guest bathroom. 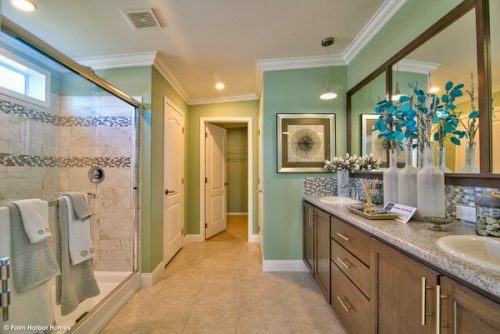 His and her sinks and a large shower complete the look in the master suite. These ceilings throughout the home are unique. 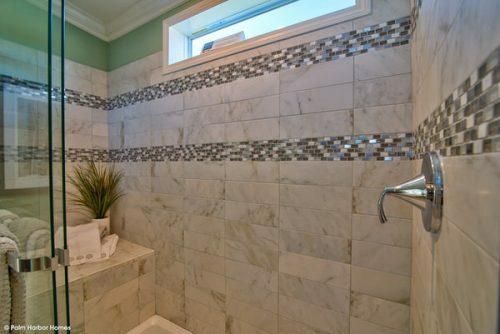 Intricate tile makes this shower stand out. 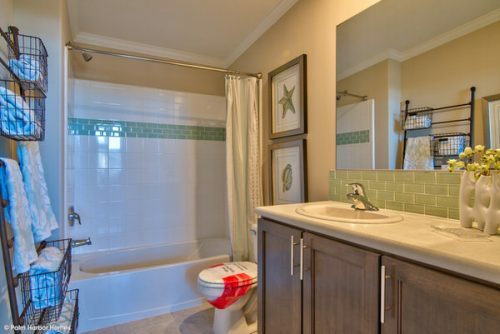 Beach themed colors flow into the guest bath. Did you notice the wrap around porch on this double wide mobile home design? That is something we don’t see very often in a home that is set up on a lot. 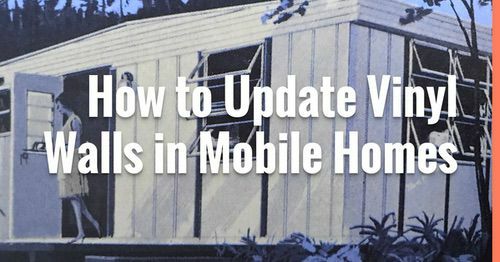 This may be just an added option when setting the home upon the stilts but it really adds to the total effect that the builders of this mobile home were going for. This home is only available in Florida at the moment. But, we couldn’t imagine setting it up in the mountains of West Virginia anyway! 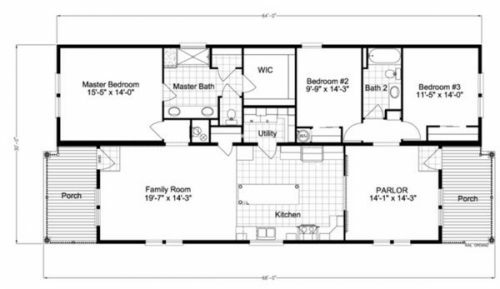 Floor plans make it so much easier to get the feel for the home. 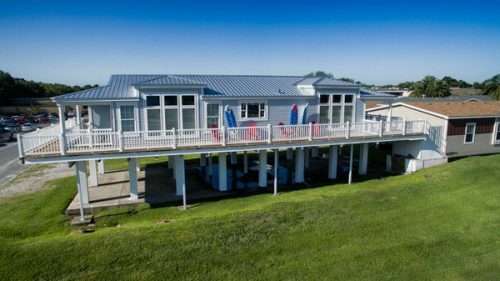 The stilt set up comes at an extra cost but is perfect for coastal living. 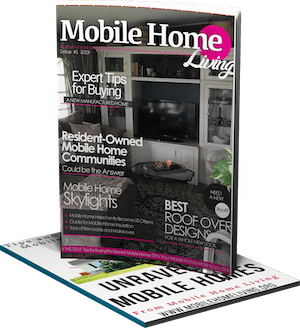 Want to see more of this double-wide mobile home design? Check out this video tour! 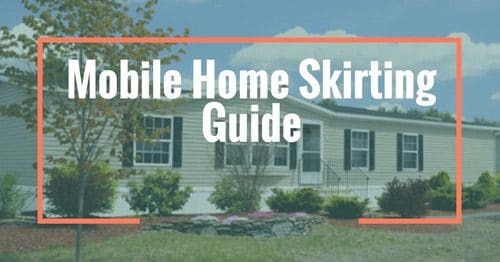 We have been enjoying these looks at new mobile home designs. 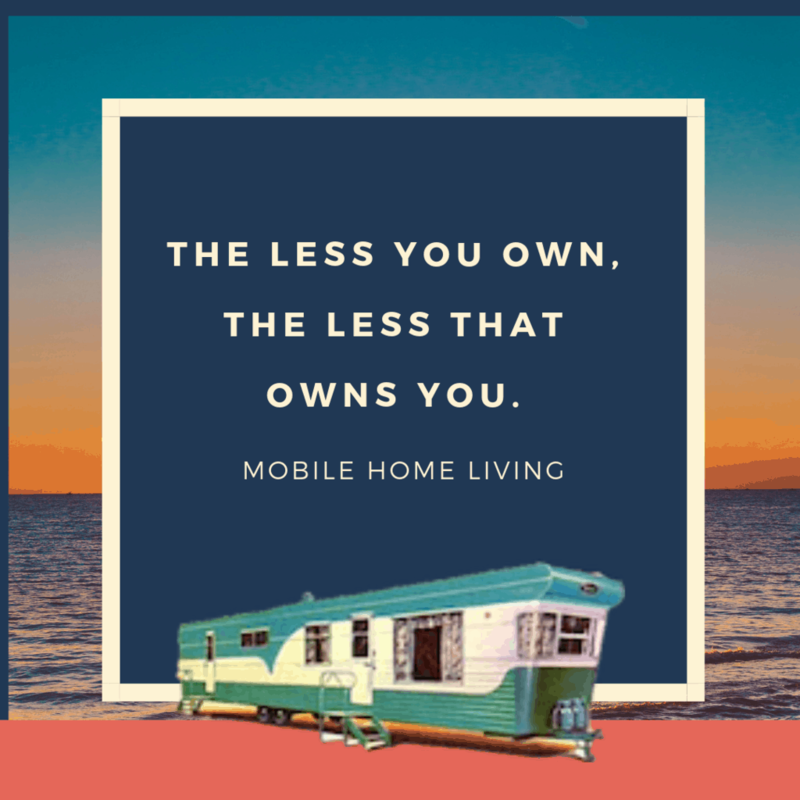 It’s nice to daydream about the latest designs and give ourselves inspiration for our own mobile home. Let us know if you would like to see more in the future. Larger pictures would be helpful and wonderful! Especially when posting floor plans. Thanks for the suggestion! We have to stay within a smaller image size so that pages will load quicker but I may be able to get something done so that you can click on it to enlarge. I’m not smart enough to do it myself but I’ll put that on my list to ask when I get with a professional.